Oxygenics is an interesting brand. Most brands for products specialize in a certain niche in order to stand out from the crowd. This holds as true for appliances like washing machines as it does utilities like water heaters and luxuries like ping pong paddles. Oxyenics is no exception here, and its niche seems to be…providing for niches. If, on the other hand, you’re curious about the other options and how I came to my decision (which could help you in picking one in the future! ), let’s begin! The unit itself is made of plastic with modifiable finishes, nothing too special. The design itself is the interesting part. 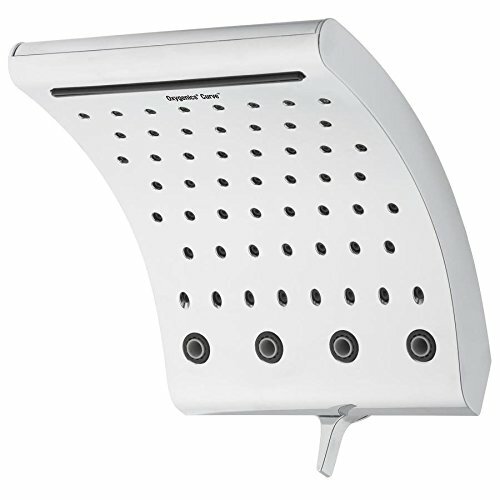 It can be used as a normal rainfall shower head (the curved design makes the spray pattern feel like a true rainfall product without needing to be hung directly overhead), but that’s the boring, if in most cases most practical option. The really interesting ones are the “Multi Oxygenics” setting (pictured above) that sprays a somewhat more high pressure spray straight out (great for a bit more pressure on the scalp or for thick hair, which rainfall types sometimes struggle with) and the Waterfall setting, which uses that top wide hole to simply cascade a sheet of water down (great for rinsing, or again hair). Combined, these three settings may provide fewer options than many other models, but they do provide more unique and useful options than most. My main complaint is that it lacks a massage setting (the Multi Oxygenics settings could have been improved by having a pulsing massage option on it), but that’s a minor gripe, and well worth it for the under $100 price tag. A solid multi setting product. The worst I can really say about this one is that it’s fairly standard. It has seven settings: full (Wide Stream), jet (Focus Stream), massage, Multi Oxygenics (a wide, powerful flow from those two larger holes), flood, pause (one of my favorites to see), and a combo of Wide Stream and Focus Stream. Good quality plastic and easy to clean nozzles with a nice finish round out the package to satisfaction. Not much more to say really, it’s just a good, quality model at an affordable price (under $50). It also comes in a handheld version if that’s more your speed; the handheld and fixed versions are otherwise identical. A decent “faux rainfall” unit. I’ll get this out of the way first: I don’t consider any unit to be a true rainfall shower head unless it hangs directly overhead and lets the water fall down like rain. Still, faux rainfall types like this aren’t bad, and could even be preferable for many. They tuck out of the way (unlike a rainfall, which can be bothersome for tall people if installed in the same location as a standard unit) and often come with extra options (unlike true rainfall types, which generally only have one setting: rain). This one comes with its rain setting (Broad Wash), plus a full setting (Wide Stream), jet (Focus Stream), Multi Oxygenics (which seems to be different on every product, though they primarily fire on all cylinders from whatever the largest holes on that particular shower head are), massage, and a flood option. You do pay a bit extra for the rainfall mimicry (as always), but it’s still a great product and worth paying a bit over $50 for. An interesting, if niche option. 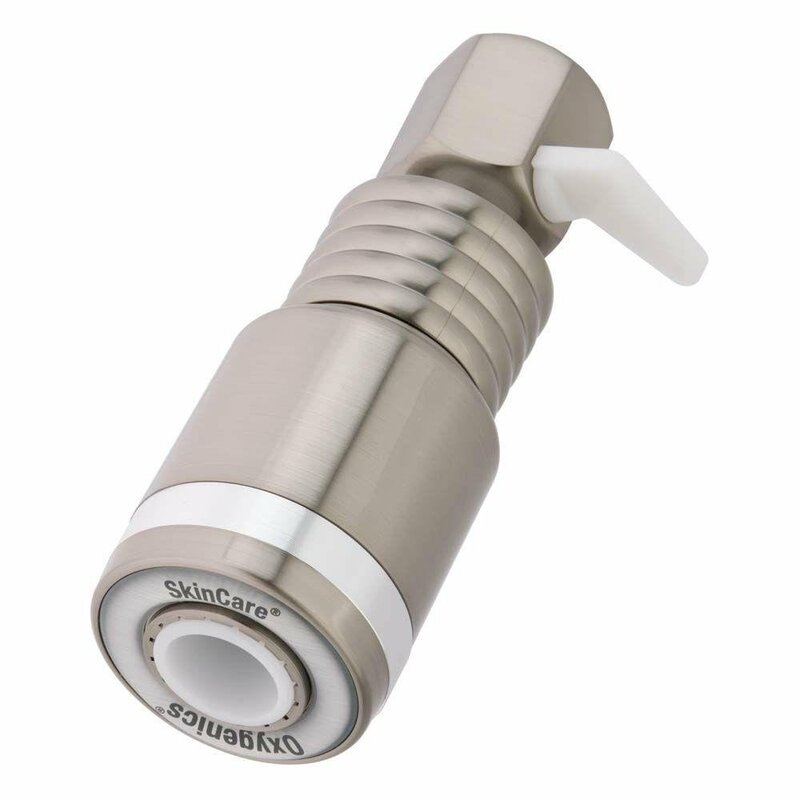 This one I feel serves as a supplement to an existing shower system rather than your sole unit, but as that (especially if attached to a hose) it makes a neat high pressure, medium flow shower head. It has one setting: a fast jet from its single hole using 2.0 GPM. That’s about it, really. It’s also designed to not clog (and has a limited lifetime warranty against such). It makes a good water saving pressure booster specifically, aerating the water so more is done with less. The only thing I’m iffy on is the price: over $40 for a single function is pretty steep, but if it’s the kind of shower you like or you need something like it for your daily routine, give it a try. One last great niche option. Tis one uses similar tech to the above to aerate water to increase the feeling of the water without increasing the actual flow, helping to save water and provide a satisfying shower at the same time. Its other main claim to fame is a pause function, enabling easy “navy showers” (wet, pause, lather, rinse, using as little water as possible). Combined with its construction (designed to reduce clogging and other build up), it makes an excellent RV shower. Admittedly, this isn’t the ultimate option for everyone, but for those who DO need it, and are using an RV’s built in water tank especially (sometimes unavoidable if you can’t find a place to park for the nigh with a proper water hook up) it can be a godsend. Not bad for under $50. A decent low flow handheld. As a rule I’m not a huge fan of low flow shower heads. I get why some need them (in the case of RVs as above, for instance), but I like my showers with high heat and high pressure water, and a big part of handhelds is getting to use the massage and jet options in my opinion, but this one still strikes me as pretty good even with that caveat. It’s basically a smaller version of the Power Select (its handheld version). It has five settings: Wide Stream, Focus Stream, Massage, Multi Oxygenics, and Flood an is constructed of much the same stuff. For lacking the combined stream and pause, you get to save a few bucks (it’s under $50) and get a very good low flow shower head. Great for kids, and not bad on its own merits. 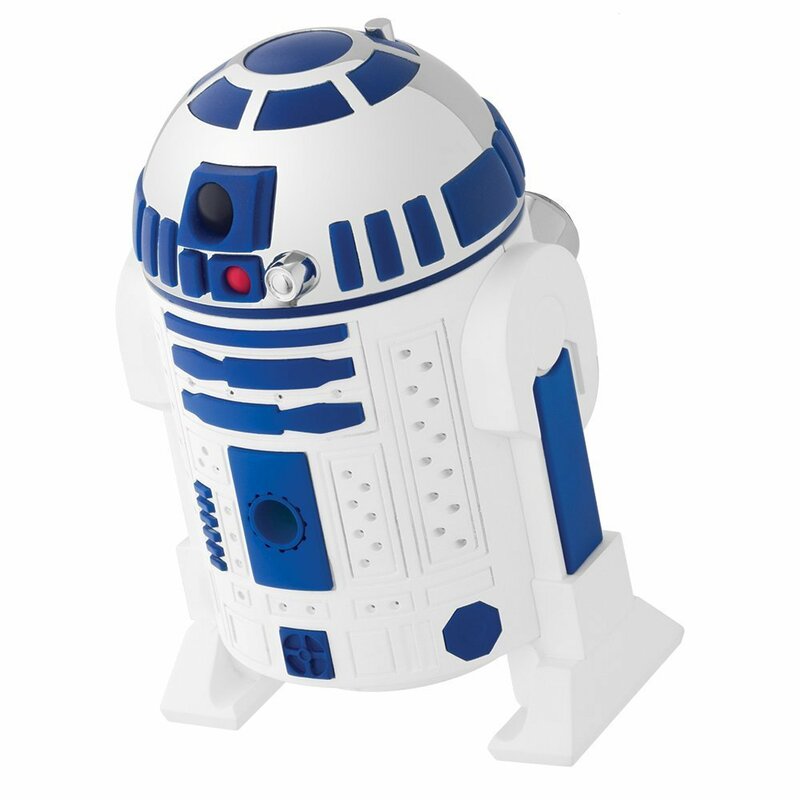 By no means will this shower head blow you away by how amazing it is (unless you’re a HUGE fan of R2D2 shaped products), but it’s a good cheap shower head that should keep the kids happy for a while. It may not look it, but it actually has three settings, one of which is a water saver mode (similar to others on this list that aerates the water to increase the feeling of volume at a lower flow). It is constructed of plastic, of course, though seems to lack easy to clean or clog resistant nozzles. 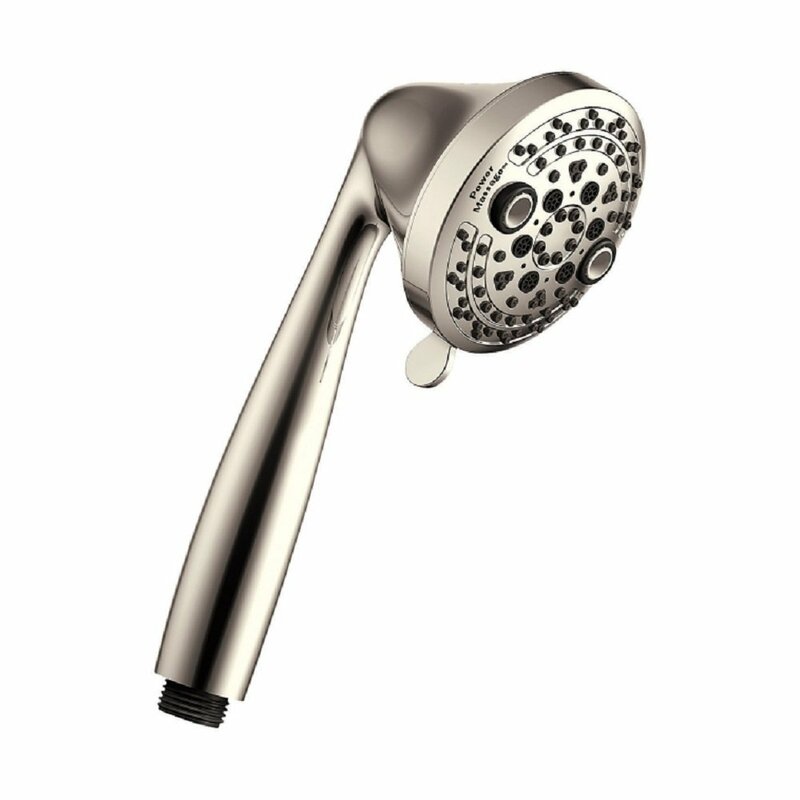 Still, for under $30 you won’t have too much buyer’s remorse with this novelty shower head. Oxygenics makes a number of quality products, though most of them are pretty niche options overall. Still, if you fall within that niche, you can’t go wrong with these ones. The Curve, Drench, and Power Select options are great for anyone, of course, and I’d recommend all of them depending on what you want. It’s hard to recommend the Drench over the Curve for someone who wants a rainfall shower head, but it works better for a mixed preference household or someone who swaps settings a lot during their shower for different purposes. The Power Select is of course second place for a reason: it’s good for pretty much everybody, even if it isn’t absolutely perfect for some. All in all, you can’t go wrong with most of Oxygenics’ options. 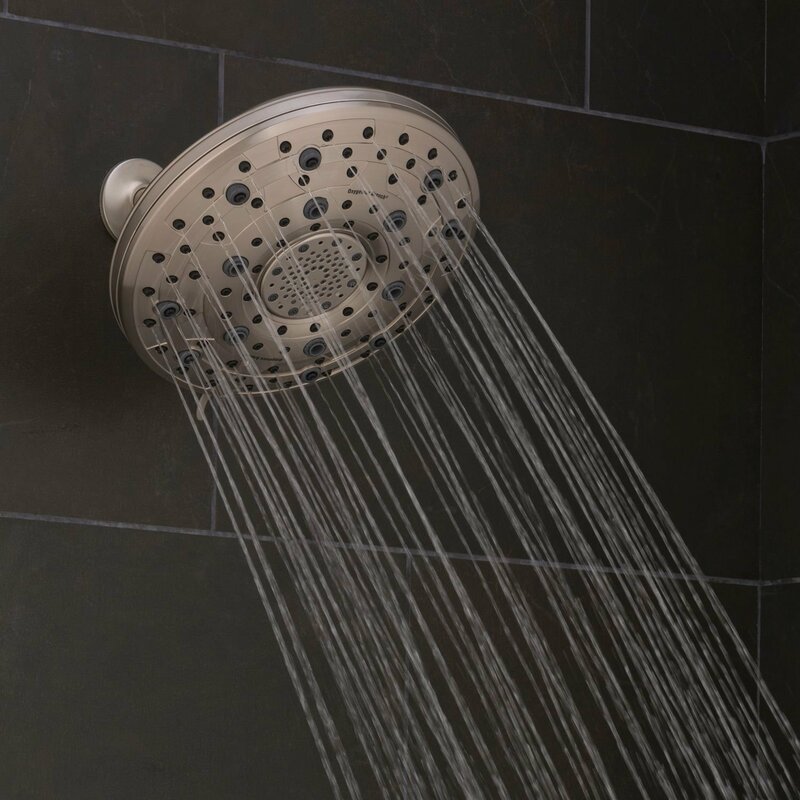 When choosing a shower head, there’s only a few things you need to keep in mind: the construction, the settings (or what it does), and the price. Most Oxygenics shower heads will be made of plastic. Even the best Oxygenics aren’t usually made of metal on the face. The nozzles will be touch clean rubber or plastic as well. Basically, construction is one of the few things Oxygenics hasn’t tried to innovate or make unique, but I think we can forgive them for that. Most have multiple settings, often six or seven. The basic ones I usually consider necessary are a full body spray, a jet, and a massage option, though extras are always nice. 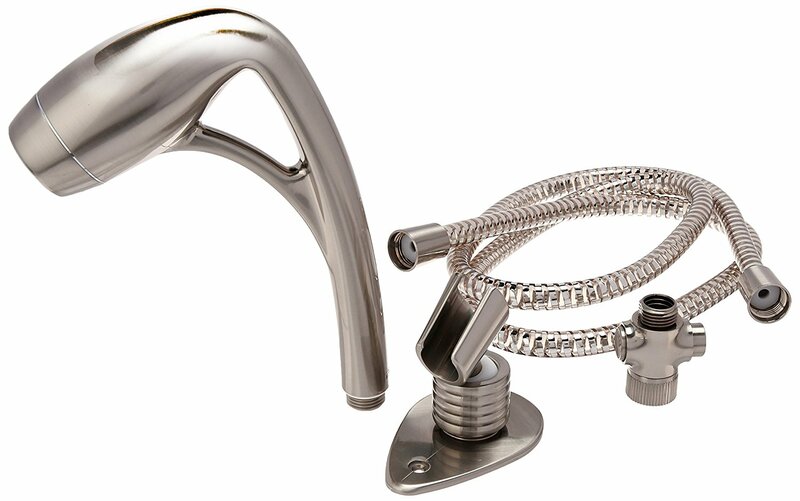 There are also some more unique settings that fit niche purposes, like pausing the water flow to save water or aerating the water to increase volume or pressure but not water usage. Keep an eye out for these; while not everyone needs them, they can be a big help. 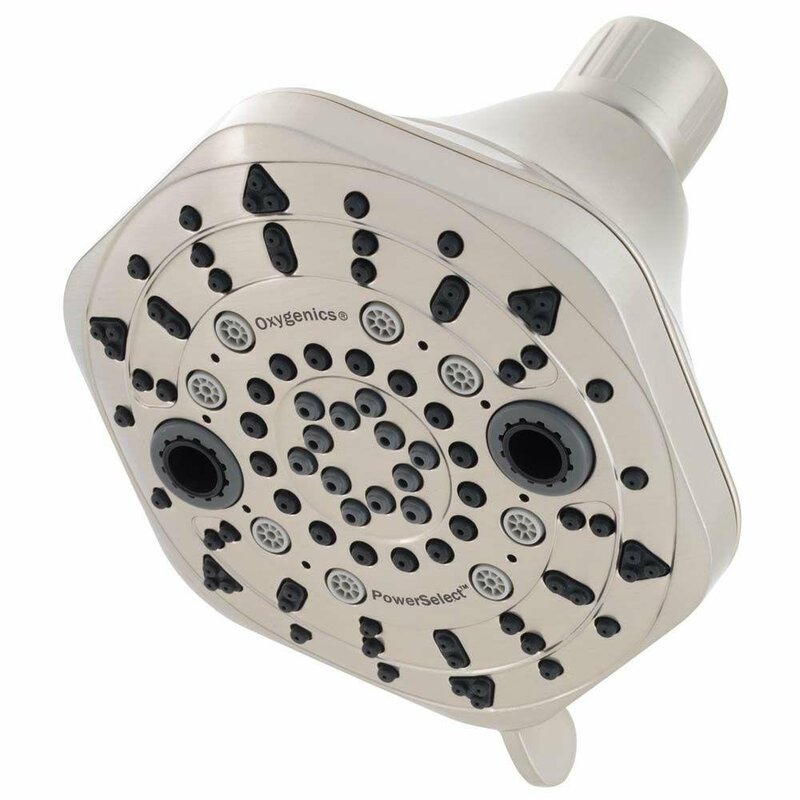 Oxygenics shower heads are usually middle range, somewhere between $30 and $100, with most in the $50 range. This makes them affordable, but not cheap per say, making sure that Oxygenics doesn’t need to cut corners to meet the lower pricing. Nothing on this list today will fall outside that range, so with that said: let’s get to them!